Home All News News UNIST Signs MoU with Daewoong Pharmaceutical Co. Ltd. 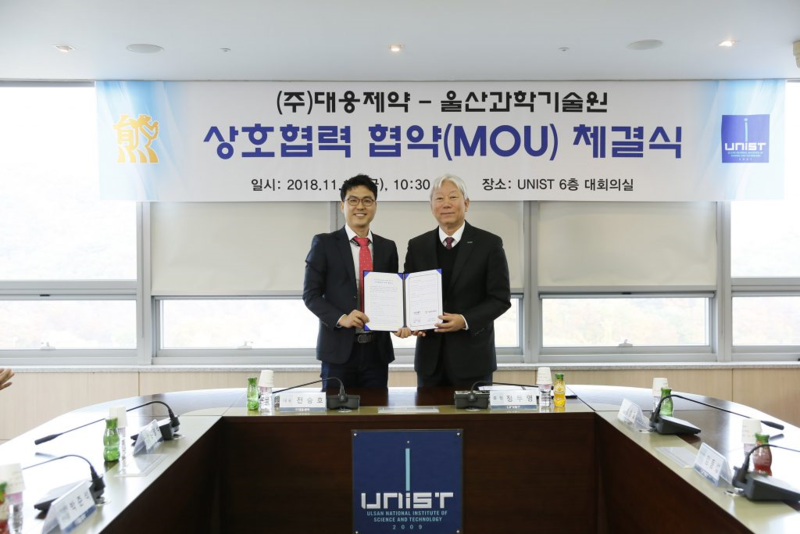 The signing ceremony of MOU between UNIST and Daewoong Pharmaceutical Co., Ltd. took place at UNIST on November 16, 2018. The signing ceremony of MOU between UNIST and Daewoong Pharmaceutical took place on November 16, 2018. 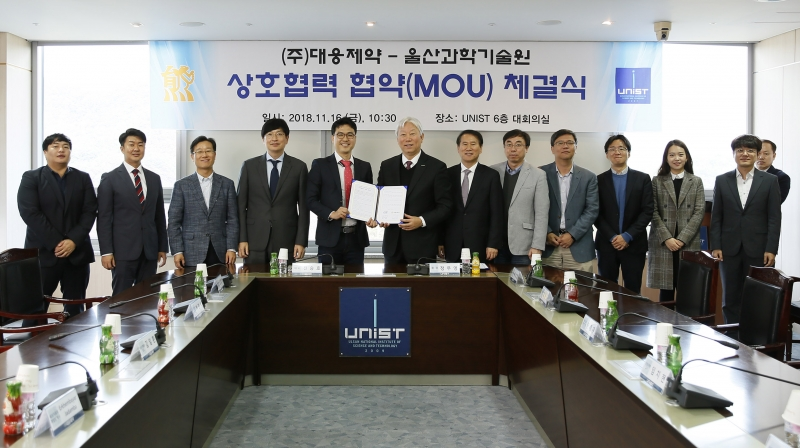 UNIST signed an industry-academia cooperation agreement with Daewoong Pharmaceutical Co. Ltd. for AI-based new drug development. This partnership will contribute greatly to new drug discovery through the identification of promising candidates for drug leads and the processing of vast amounts of data required for pharmaceutical validation, thus contribute greatly to new drug discovery. The signing ceremony of the MoU between UNIST and Daewoong Pharmaceutical Co. Ltd. took place in the main conference room of the Main Administration building at UNIST on November 16, 2018. Under the agreement, the two organizations promised to bring new challenges to the current drug discovery system, using Artificial Intelligence (AI) technology and Big Data. The development of a new drug requires is an expensive and time-consuming process that is subject to extensive regulatory requirements. However, the synergism of big data and artificial intelligence holds amazing promise for new drug discovery, as it will significantly shorten the process required for the identification and validation of potential drug targets. Furthermore, using AI-based analytics, one can easily find a new drug against a chosen target for a particular disease. From left are President Seung-ho Jeong of Daewoong Pharmaceutical Co., Ltd. and President Mooyoung Jung of UNIST. This requires the practice of data science, which requires the use of analytics tools, technologies and languages to help data professionals extract insights and value from data in various forms. The newly established School of Management Engineering at UNIST has been recognized for its growth potential in data science. The school promotes advanced research on data science and seven out of eight faculty members are data science experts. Under this partnership, Daewoong Pharmaceutical Co. Ltd. will engage in data processing for new drug development and experimental analysis of new drug candidates. In turn, UNIST plans to develop data analysis algorithms and AI technologies for new drug discovery.